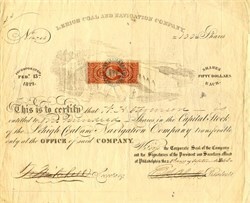 Beautifully engraved certificate from the Lehigh Coal and Navigation Company issued no later than 1868. This historic document has an ornate border around it with a vignette of a small town. This item is hand signed by the Company’s President and Secretary and is over 140 years old. IRS tax stamp affixed to face of stock. The Lehigh Navigation (referred to as the Lehigh Canal) was constructed to carry anthracite coal from the upper Lehigh Valley to Easton. Its creation was the direct result of Phillip Ginder's discovery of large deposits of anthracite (hard coal) near Summit Hill, Pa. in 1791. Ginder's discovery led to the formation of the Lehigh Coal Mine Company which successfully transported anthracite down the turbulent Lehigh and Delaware Rivers to Philadelphia. By 1820 a downstream navigation system was completed which would allow arks loaded with coal to navigate from the present site of Jim Thorpe, (Mauch Chunk) Pa. to Easton. This navigation system was made possible by Josiah White's invention of a system of "bear trap" or hydrostatic locks. These "bear trap" locks increased the depth of the Lehigh by creating small artificial floods which carried the loaded arks downstream. 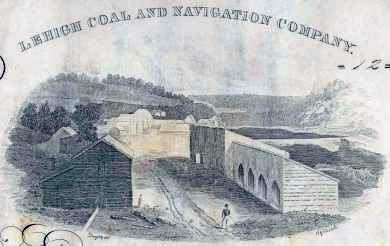 To obtain additional investment capital the Lehigh Navigation and the Lehigh Coal Company were merged to form the Lehigh Coal and Navigation Company in 1821. By 1825 this new company was shipping over 30,000 tons of anthracite to Philadelphia annually. Increased competition from the newly completed Schuylkill Navigation System and a desire to establish both ascending and descending navigation on the Lehigh led the company to rebuild its waterway into a conventional canal with lift locks. Designed by Canvass White, formerly engineer of New York's Erie Canal, the Lehigh Navigation combined slackwater pools and canal sections. It was constructed between 1827 and 1829. The enlarged Lehigh Navigation was over 46 miles in length between its terminal points of Mauch Chunk (present Jim Thorpe) and Easton. It had a total of 52 locks, 8 guard locks, 8 dams and 6 aqueducts. These engineering features enabled the waterway to overcome a difference in elevation of almost 355 feet. The Lehigh Navigation also had the largest carrying capacity of any of the anthracite canals at the time of its completion since the locks were large enough to allow the passage of vessels which could carry over 200 tons of coal. However, the smaller sizes of the connecting Morris and Delaware canals limited the Lehigh Canal boats to 95 ton loads. Within five years of its completion the enlarged Lehigh Navigation had been linked to both Philadelphia and New York by means of the Delaware Division Canal and Morris Canal respectively. As a result the lower Lehigh Valley was the only region in America to have efficient transportation connections with New York and Philadelphia, America's two largest metropolitan areas during this period. This factor combined with water power available from the Lehigh Navigation helped to make this region a birthplace of the American Industrial Revolution. Seeking to tap the rapidly developing Beaver Meadow coal fields near the site of present Hazelton, and also to connect with the Susquehanna River and the great Wyoming coal fields at Wilkes-Barre, the Lehigh Coal and Navigation Company constructed a northward extension of its navigation system between 1835 and 1838. Designed by the brilliant engineer E.A. Douglas, this 26 mile northern extension to White Haven, which was called the Upper Grand Section of the Lehigh Navigation, was one the greatest engineering feats of the Nineteenth Century. Utilizing 20 dams and 29 Locks, this waterway overcame a difference in elevation of over 600 feet between White Haven and Mauch Chunk. The locks of the Upper Grand Section were particularly impressive. Lock 27, which was also named the Pennsylvania, was located near Lehigh Tannery, and was able to raise or lower boats over 30 feet to the next level. Northward out of White Haven the Lehigh Coal and Navigation Company constructed the Lehigh and Susquehanna Railroad with its innovative Ashley Planes (inclined planes) to reach the Susquehanna at Wilkes-Barre. The Lehigh Navigation System reached its peak in 1855. In that year it carried more than one million tons of cargo. However, 1855 also marked the completion of the Lehigh Valley Railroad between Mauch Chunk and Easton. Competition from this new anthracite carrier began to reduce the navigation system's cargo. Of even greater importance was the devastation inflicted on this waterway by the great flood of June 4, 1862. Both the main canal and the Upper Grand Section were almost totally destroyed. Although the portion of the Lehigh Navigation between Mauch Chunk and Easton was rebuilt, the Upper Grand Section was replaced by an extension of the Lehigh and Susquehanna Railroad. Between 1865 and 1867 this line was further extended to Easton were it connected with the Central Railroad of New Jersey. In 1871 the Lehigh and Susquehanna was leased to the Central Railroad of New Jersey. During the 1870's and 1880's the decline in tonnage carried by the Lehigh Navigation continued. By 1880 the tonnage carried had fallen by over 50% and by 1900 it had fallen to less than 1/4 of its 1855 peak total. The Lehigh Navigation continued to function as a transportation artery until 1932, making it the last fully functioning towpath canal in North America. Portions of the Lehigh Navigation were utilized to carry reclaimed coal silt until 1942 when a flood ended towpath navigation. In 1962 most of it was sold to private and public organizations for recreational use.